Need more information about booking Home 9180121 ? D B Villa is a perfect retreat away from the hustle and bustle of the city. 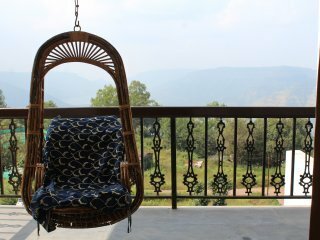 Nestled amongst the lush greenery of the Western Ghats in Panchgani, our villa is a perfect retreat for the nature lover and anyone who needs a break from their monotonous life of the city. The bedrooms, breathtaking sit-out & garden present an unmatched magical panorama of hill ranges, krishna river & valleys. Ideal for a group of happiness seekers who like to spend time with nature and relax. There are a total of 3 bedrooms. The price quoted is for each private bedroom with independent access. There are 2 bedrooms on the upper level and 1 bedroom on the lower level. Guests get their private bedroom with an attached bathroom (lower level has a separate bathroom), & a private spacious balcony/terrace. Some areas such as the Living room, Kitchen, Dining Area, Master bedroom etc are private to the owner and have limited access. You can get in touch with JEWEL (the owner) through the contact form on this page. Send JEWEL (the owner) an email through the contact form on this page. Alternatively, if there’s a phone number on this page, you can call them. How do I contact JEWEL (the owner)? If you’ve already booked, go to Manage your holiday booking to view JEWEL the owner's contact details or send them a message. Or send JEWEL (the owner) an enquiry through the Contact the owner/manager form if you’d like a quote or more info first. When you pay online through the Book your stay form, a booking request is sent to JEWEL (the owner). You’ll find out within 24 hours whether they’ve accepted - no money will leave your account before then. You can also request a quote from JEWEL (the owner) through the contact form. The owner will email you the total cost for your dates and a link to book and pay online. Use the Book your stay form to pay provisionally online. You can pay by credit/debit card or PayPal. JEWEL (the owner) will have 24 hours to accept the booking and no money will leave your account before then. Why can't I call JEWEL (the owner) before booking? You’ll need to contact JEWEL (the owner) to do this. Send them a message in Manage your holiday booking or through the contact form on this page. You can request to change the dates or number of people on your booking via the Manage your holiday booking page. To change your holiday dates use the Edit booking button. If you need to change the number of guests staying then send JEWEL (the owner) a message. If JEWEL (the owner) agrees, they’ll send you a revised quote outlining the changes. You can review and accept/decline this from the Manage your holiday booking page. You’ll have 48 hours to take action before the revised quote expires. Estimated price per night based on a weekly stay. Owner fees of £12.00 per stay may apply. Enter your dates to see the total cost.